Rio is a 7 year old F/S yellow Labrador Retriever. She functions as a therapy dog within the family and aids some family members with control of medical issues. Three weeks before presentation the owners noticed an acute personality change. Rio is normally a very outgoing, active, and playful dog who abruptly became very quiet and sedentary. She still obeyed all her commands and maintained her housetraining, but without any enthusiasm as previously. At presentation Rio was quiet but responsive. The only detectable neurologic deficit was a very slight hypermetria of the right forelimb. She did tend to shy away when her head was approached and there was a persistent blepharospasm of the left eye. The owners reiterated that this was nothing like her typical personality. Based on these findings an intracranial lesion lateralizing to the left was suspected. A CBC/serum chemistry and thoracic radiographs were completed, and no diagnostic abnormalities were found. MRI of the brain and skull was performed and a surprisingly large mass with characteristics mostly of bone tissue was found growing from the left temporal bone (Figure 1). The mass extended outward into the left temporalis muscle and inward to cause severe compression of the left cerebral hemisphere (Figure 1). The mass extended cranially and caudally for about 2/3 of the length of the left cranial vault (Figure 2). Figure 1: Axial T2-weighted MRI section demonstrating extension of the mass both extracranially into the left temporalis muscle and intracranially into the left cranial vault (arrowheads) showing severe compression of the left cerebral hemisphere. Note the apparent density difference between the intracranial and extracranial components of the mass. Figure 2: Coronal T1-weighted MRI post-contrast with fat suppression showing cranial/caudal and intracranial/extracranial extension of the mass in the cranial vault (arrowheads). The distinct density difference between intracranial and extracranial components can be seen. The intracranial and extracranial portions of the mass had different imaging characteristics in density. The immediate presumptive diagnosis was multilobular tumor of bone (also known as multilobular osteochondrosarcoma/MLO and previously as chondroma rodens). 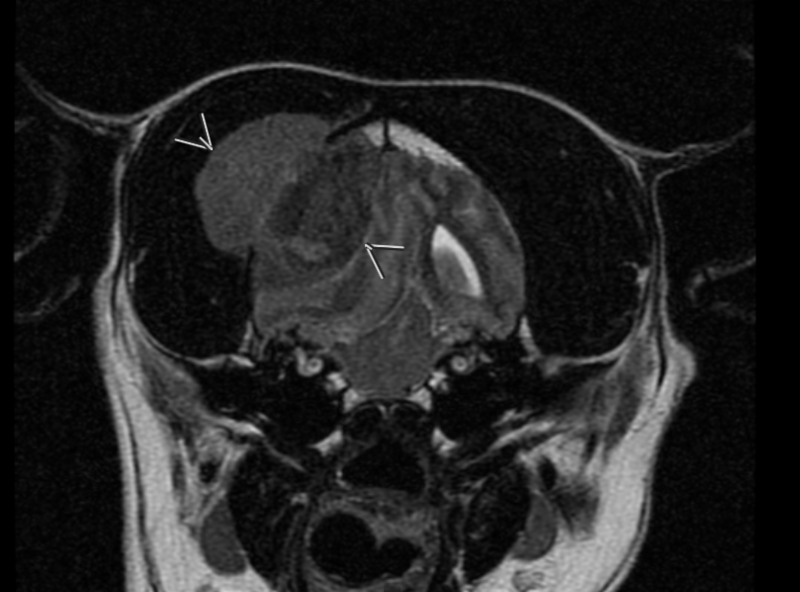 This tumor is a comparatively non-aggressive and slow-growing neoplasm, which frequently allows it to grow to a truly remarkable size before clinical signs become evident. 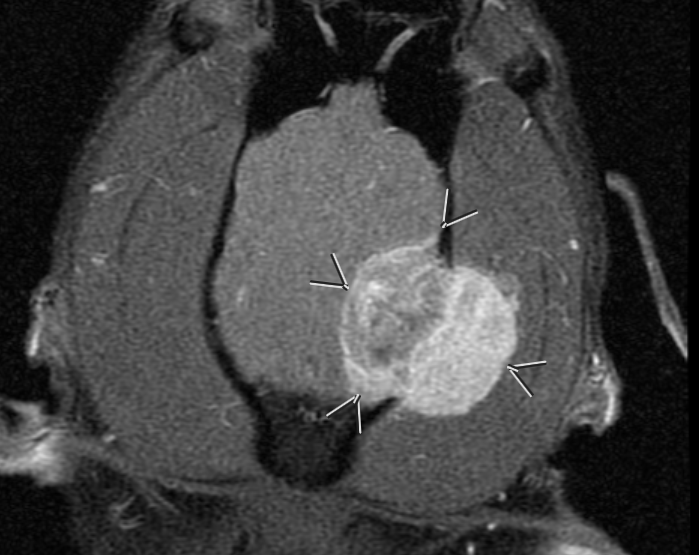 Interpretation by a board-certified radiologist suggested, due to some less typical densities within the tumor, that it could be a more aggressive primary osteosarcoma or chondrosarcoma. There were also imaging indicators that the size of the mass was close to triggering tentorial herniation. 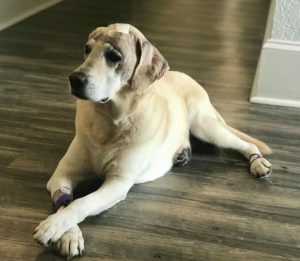 Following the MRI, Rio was treated with corticosteroids and famotidine and discharged for home care pending a surgical plan. She was taken to surgery 5 days later for a left rostrotentorial craniectomy. The exterior portion of the mass was removed first, followed by drilling out the temporal bone and breaking up and removing the intracranial portion. All visible tumor was removed and a prosthesis of polymethylmethacrylate (PMMA) was constructed to cover the defect created in the temporal bone (Figures 3 and 4). Total surgery time was approximately 4 and ½ hours. She recovered quickly from anesthesia and after a day of observation, was discharged to her owners on the second postoperative day. The owners commented at discharge that her personality seemed to already be returning to normal. Figure 3: Intraoperative photograph depicting the open defect of the skull following removal of all visible tumor. Figure 4: Intraoperative photograph showing the PMMA prosthesis covering the surgical defect of the skull. The final histologic diagnosis was multilobular tumor of bone. The pathologist commented that despite the gross differences in density between the intracranial and extracranial portions seen on MRI, there was no histologic difference between the two. Further comment was microscopically the tumor was very non-aggressive and the mitotic index, which is used as a measure of malignancy and aggressiveness, was extremely low. This indicates a very slow growing tumor, which it would have to be to achieve the size that it did without more significant morbidity. This tumor is also typically very sensitive to radiation and consultation with a radiation oncologist is currently underway. Between the predicted very slow growth rate/low mitotic index and the radiation sensitivity of this tumor, Rio is expected to have considerably more good quality life in her future. At the time of writing, Rio had returned for her 2 week post-operative re-check. Her owners were thrilled to report that Rio had already regained her old, exuberant personality! Her neurological examination was normal, and her incision had healed well. The owners have contacted a radiation oncologist and plan to complete full course radiation therapy in the near future.